She rummaged through her handbag and pulled out a small mirror and a tissue. She dabbed the runny kohl from under her black-rimmed eyes. Then she peered over her own reflection and looked around the shop. Abu Issam, finally feeling noticed, repeated his warm welcome. "What a pleasure to see a fresh face in our bakery! Welcome to my store. I am Abu Issam. The owner of this humble establishment. Please, let me know what I can do for you. Your wish is my command," he declared. "Thank you, Muallim. That's very kind of you," she replied. "I'd like to order a hundred and fifty ma'amoul with date filling, please." "Madam, please. There is no need for the formalities. 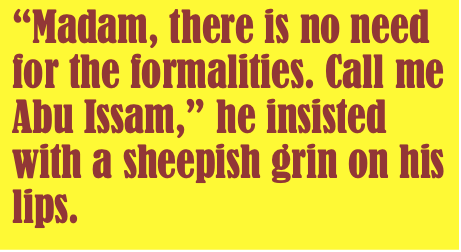 Call me Abu Issam," he insisted with a sheepish grin on his lips and a flirty sparkle in his beady, brown eyes. 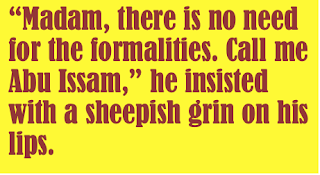 "Alright then, Abu Issam," she answered politely. "As for the hundred and fifty ma'amoul. They'll be ready by this afternoon. Do you want to pick them up or would you like them delivered some place?" he asked. His smile was replaced with an earnest expression. "No, no, no," she said, clicking her tongue in disapproval. "I need them right away. I have guests coming over in an hour." "I'm sorry, Madam, but we're swamped with orders. After all, we are the best bakery in all of Aleppo," he said proudly, his chest puffed like a rooster. "I'll tell you what. Why don't you take fifty with you now and we'll deliver the rest later?" He turned to his aide in the back, who was still in a trance. "Jassem! Stop staring and get me Abu Haitham's order! Yallah!" he yelled. "We can make a fresh batch for him later." The boy rushed to fetch a cardboard box and handed it to his boss, who in turn set it on the counter in front of the young woman. "There you go, Madam," he said. "Where would you like the rest delivered?" "You can drop them off at my husband's store across the street. The goldsmith over there," she replied, pointing out the window. "The goldsmith? Uh - Abu Ghassan is you husband?" stammered Abu Issam. He scratched his black toupee, shifting his hairline back by an inch. His now extended forehead emphasized the surprised look on his face. "Yes, exactly. Abu Ghassan," she assured him. "Then I'll deliver the remaining hundred ma'amoul to him personally! He's a dear neighbor, your husband. A very decent man," he praised. "Thank you. Sweet of you to say. But now tell me, Abu Issam. How much do I owe you for the ma'amoul?" she asked. "No, nothing at all. The first order is on the house for new customers. It is a tradition in my shop. So that we can have the pleasure of welcoming you here again. Ahlan wa sahlan," he said and smiled at her like a teenager with a crush. The boy at the oven snorted loudly and smirked. His boss shot him a warning glare that sent him back to the counter in the back, where he slouched over the balls of dough and started kneading briskly. "No, I can't possibly accept your generous offer, Abu Issam," the young woman protested. "Please, let me pay for the ma'amoul. After all, we're neighbors, not strangers." "By Allah, neighbor! You're embarrassing me," he said, blushing. "But if you insist." "I insist," she asserted, pursing her lips impatiently. "Fine then. A hundred and fifty ma'amoul. That makes one thousand two hundred Liras. Let's say one thousand, ma'alesh." "Here you go," she said, handing him a wad of cash from her purse. "One thousand Liras." "And here are the first fifty ma'amoul," he replied, pushing the cardboard box on the counter towards her. "Enjoy them, inshalla." "Thank you. I'm looking forward to tasting them," she said, covering her black curls with her white scarf. She bid him farewell and waved good-bye, as she walked out of the bakery. "Ma'asalameh, Madam," he called. "Come back soon and enlighten our shop with your visit!" He stared after her with a dopey grin on his face, as she rushed across the street in the pouring rain and entered Abu Ghassan's jewelry store. "Would you please show me that necklace in the window and the bracelet over there? The one with the red rubies," she asked the goldsmith behind the counter. "Of course, Madam," replied Abu Ghassan. He reached into the display and undressed the plastic bust. "Here you go," he said, presenting the two pieces to his new customer with the curly black hair. "How much are they?" she asked, weighing the jewelry in her hand. Abu Ghassan placed them on the scales and started punching his calculator with his index finger. He mumbled some numbers under his breath and scratched his shaven chin. A few moments later, he looked up at the young woman. "I can give you the necklace for twenty thousand. The bracelet on the other hand is heavy and the ornate design is very elaborate. It's a bit more expensive. Thirty-three thousand Liras," he said. "Do you have something heavier than this necklace? Show me that one over there," she said and pointed at the show case behind him. "This one, Madam?" he asked, as he retrieved a thick necklace from behind the glass. "Are you sure? It is more for older women or Bedouins. You have a slender neck and fine features. Maybe something more delicate would be more to your taste." She wrapped her fingers around the necklace and slowly poured it from one hand into the other. Again, the goldsmith weighed the necklace, theatrically calculated the price and determined it was worth fifty-eight thousand Liras. "You see, Madam," he explained. "This design here was inspired by the Afghan motifs, mixed with our Arabesque patterns. I've never left the country, believe it or not," he chuckled, "but I love to experiment with exotic -"
"Then add the two bangles from over there and that cobra ring with the diamond eyes," she interrupted, pointing to the jewelry in the glass counter. "That should bring us to a total of about a hundred and fifty thousand. Am I right?" Abu Ghassan, appalled by his customer's lack of appreciation for his artwork, hastily weighed every piece separately and calculated their prices. "You have a good eye, Madam," he said, giving her a suspicious look. "All six pieces would cost a hundred and fifty-four thousand Liras. But one hundred and fifty thousand is fine, ma'alesh. As you wish." "I'll take them then," she said and rummaged through her handbag. "Very well. Would you like me to put them in a fancy gift box for you?" he asked. "No, that's fine. I'll just put them in my bag," she answered. She pulled out a stack of banknotes out of her purse and handed it to Abu Ghassan. "Here are fifty thousand. My husband will bring by the rest later this afternoon. He owns the bakery across the street," she said and reached out for the necklaces. "Abu Issam is your husband?" he asked, blinking nervously. He yanked the jewelry back out of her hand before she could answer. "Forgive me, Madam," he said. "Not to sound rude, but it's a lot of money. I can't just take your word for it. Why don't I put the necklaces aside for you and your husband can pick them up when he drops off the money." "I understand your worries but I need the necklaces now. They're a present for my mother in Damascus. The Pullman bus leaves in an hour," she urged. "Come with me to the bakery and talk to Abu Issam yourself. It'll only take a minute." "I'd have to lock up the store then," said Abu Ghassan. He patted down his suit and fondled with his keys, jingling in his jacket pocket. He looked out at the pouring rain and winced. His nostrils flared in disgust. The young woman peered out the window. "He's standing in the doorsill, smoking," she said. "I'll just call out to him. You won't have to leave your shop." She wrapped her hair in her white scarf and stepped out into the rain. The goldsmith accompanied her up to the doorsill and carefully stuck his hairless head out. "Abu Issam! Abu Issam!" she shouted across the street. The bakery owner with a cigarette in one hand, waved at them with the other. "You'll bring by the hundred later this afternoon, like we discussed? You'll give them to Abu Ghassan, right?" she shouted. He shamefully turned his head and exhaled a cloud of white smoke, coughed and deliberately cleared his throat. "Yes, neighbor, yes," yelled back. "I gave the Madam fifty already. I'll bring the you the remaining hundred later. Don't worry, Habibi. Just give me an hour or so." "Alright, Akhi. Thank you for the reassurance. I'll see you later, then," called goldsmith and slipped back behind his counter. The young woman followed him into the store, leaving Abu Issam lingering on the doorstep of his bakery, puckering his lips and slowly sucking on his cigarette. "Then everything is in order. Here you go, Madam," said Abu Ghassan. He handed his customer the jewelry, who hurriedly flung it in her purse. "Have a safe trip and I hope your mother likes the handicraft. Like I was saying, these are very special pieces -"
"Thank you. Ma'al salameh," she mumbled, snapped her purse shut and rushed out the door. "Al-salamu alaikum," greeted Abu Issam, as he entered the goldsmith's store. He placed a white cardboard box on the counter. "Wa alaikum al-salam!" Abu Ghassan automatically replied. "Welcome, welcome." "I'm angry at you, neighbor! You never told me how gorgeous your wife is," said Abu Issam teasingly, with a mischievous smile on his face. He bounced his eyebrows, making his black wig dance on his head. "My wife?" he asked, surprised. "Yes, you fox! No wonder you've been hiding her all this time. Were you afraid someone would steal her away from you? How long have you two been married?" "Twenty-six years," he answered. His forehead wrinkled in confusion at his neighbor's line of questioning. His bushy eyebrows met above his nose. "Really? She really doesn't look her age at all. Unless you married her as a toddler," he chuckled. "You're one lucky man, my friend. She's quite a catch." He let out a sigh of resignation. "Anyway, here are the hundred ma'amoul that she ordered this morning." He pointed to the box on the counter. "Enjoy!" "What am I supposed to do with a hundred ma'amoul?" asked Abu Ghassan. "Eat them. What else? They're for your guests. Your wife ordered them this morning and asked me to bring them by when they were ready." "Yes, your wife. What is it with you, neighbor? We talked about it just this morning. I told you that I'd drop off the hundred in an hour. Are you that forgetful?" "You said you'd bring by the hundred thousand Liras that you owed me," shouted Abu Ghassan. "A hundred thousand Liras! Why would I bring you a hundred thousand Liras?" exclaimed the bakery owner. "Because, your wife bought jewelry worth a hundred and fifty thousand Liras! She paid fifty up front and said you'd bring by the rest later. You confirmed it from across the street," screeched Abu Ghassan, as the truth began to dawn on him. "My wife? That woman said that she was your wife!" answered Abu Issam. "She came in, ordered a hundred and fifty ma'amoul, paid for them and asked me to bring them by as soon as they were ready." "Alahu akbar! Alahu akbar! My heart! Help me, someone, please! Ya rabb!" pled the goldsmith. He clasped his bald head with both hands and slumped into his chair. "What's wrong, Akhi? You're scaring me," said Abu Issam, rushing behind the counter to assist his neighbor. "That thief! She robbed me! A hundred thousand Liras in gold and stones! She robbed me!" cried Abu Ghassan, the sweat gushing down his temples and in a stream from his forehead to the tip of his nose. "You mean, that wasn't your wife?" asked Abu Issam. "I have to admit, I was a bit surprised. She is absolutely stunning." He paused for a moment and squinted, processing this new piece of information. "Alahu akbar! She stole the jewelry from you!" he exclaimed. Men mesmerised by beauty! Well crafted story, characters are interesting, good place and interesting setting. Clever, fun and well-told. Apprerently set during better times in Aleppo ... times that hopefully will return. This looks live the movie and TV shows where a crime has to work correctly to succeed. If Issam had responded 100 mah'amoul rather than just 100. If he didn't agree to the order as he did. If ... It all would have fallen apart. A clever, simple, engaging tale well told. Not sure how it would end if the owners were women. A clever story, well told. Entertaining, with a clever plot and convincing characters. An enjoyable read. Fantastic work. I really enjoyed this. The imagery works really well and I have particular interest in things associated with the Middle East. Thank you for the story!